The Tower in the central part of the city reaches 72 metres (236 ft) (including the height of the platform), however, it is not the tallest brick tower in the world (after many towers). However,it is still the tallest pure-brick tower in the world. The baked-brick-built tower is an enormous decagon building with a conic roof, which forms the golden ratio that Phi equals 1.618. The interiors contain the earliest examples of Muqarnas decorative styles. The decagon with its 3 meter-thick wall, divided into 10 sides, has a diameter of 17 m . The Tower was built on such a scientific and architectural design that at the front of the Tower, at an external circle, one can hear one's echo. 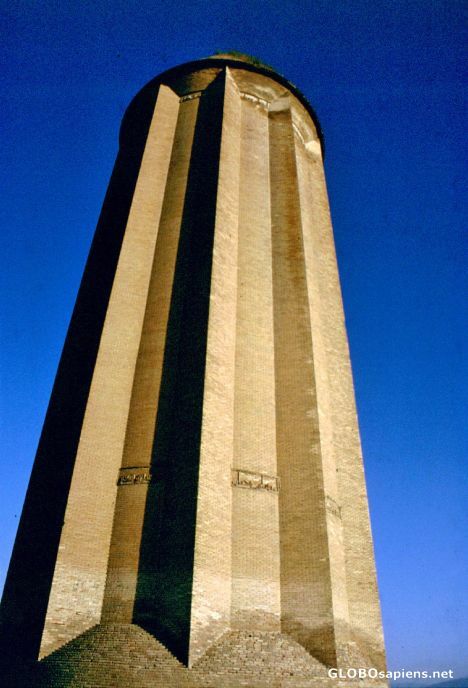 The tower was built in 1006 AD on the orders of the Ziyarid Amir Shams ol-Ma'āli Qabus ibn Wushmgir.It is located 3 km north of the ancient city of Jorjan, from where the Ziyarid dynasty ruled. The tower is over 1000 years old.